Shari Vialpando, crime scene tech for the Santa Fe County Sheriff Office, shows detectives various angles to use photographing crime scenes. SANTA FE – Shari Vialpando has many nicknames for herself – “Black Widow” and “Workhorse” among them. The monikers are an apt description of the 37-year-old crime scene technician, the first person ever to hold that title at the Santa Fe County Sheriff’s Office. In her 15 months with the Sheriff’s Office, Vialpando has helped detectives photograph and collect evidence for major cases, including homicides, assaults and suspicious deaths. It’s not a job for everyone. But Vialpando loves it. 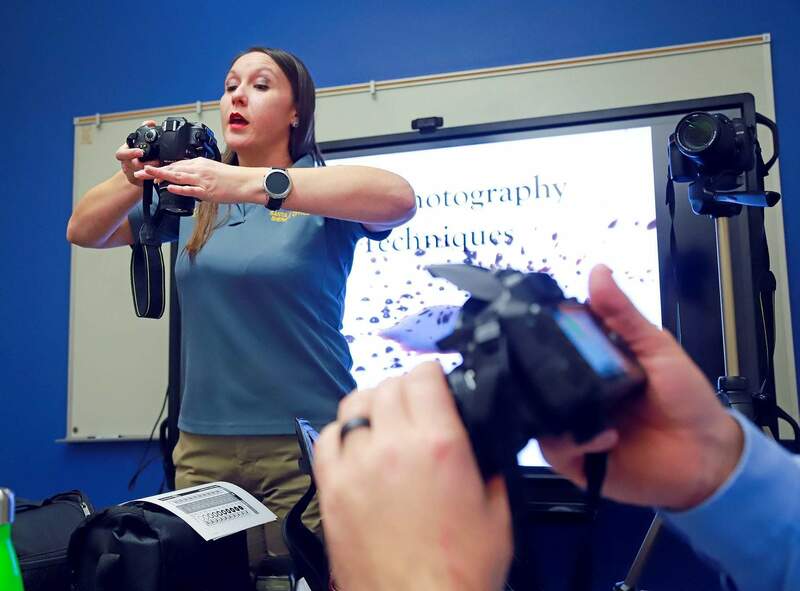 A former news photographer for the Las Cruces Sun-News, Vialpando crossed over to law enforcement about five years ago when she became an evidence technician for the Las Cruces Police Department. Vialpando grew up in Santa Fe and attended New Mexico State University, where she studied journalism and communication with an emphasis on photography. Her interest in the field was sparked by working in the darkroom as part of the Capital High School yearbook staff. When she was hired at the Sun-News, Vialpando routinely would follow the police to crime scenes. She was always curious, she said, about what happened after the police pulled down the crime scene tape. When a friend at the Las Cruces Police Department suggested she would make a good evidence technician, she made the jump. Vialpando, a single mother of three, moved to the Santa Fe County Sheriff’s Office in October 2017 so her young daughters could be closer to family. In Las Cruces, Vialpando worked with a team of crime scene and evidence technicians who would work 24/7 shifts to photograph and collect evidence for burglaries, homicides and everything in between. In Santa Fe, Vialpando works primarily on felony cases, dedicating her time to processing crime scenes and evidence for detectives so they can focus on interviews and other aspects of an investigation. In January 2018, sheriff’s detectives discovered the body of 13-year-old Jeremiah Valencia, who they believe was beaten to death by his mother’s boyfriend and the boyfriend’s son. According to documents in the case, Vialpando played a key role in that investigation, working sleepless nights to recover the boy’s body, collect and process evidence, and more. Then, in late February, the Sheriff’s Office found two bodies stuffed in trash cans near Stanley, in the southern part of Santa Fe County. Vialpando processed those scenes before turning the case over to the Albuquerque Police Department. In late June, deputies opened an investigation into the homicide of Thomas Trujillo, who was found shot to death in a home on Santa Fe’s south side. 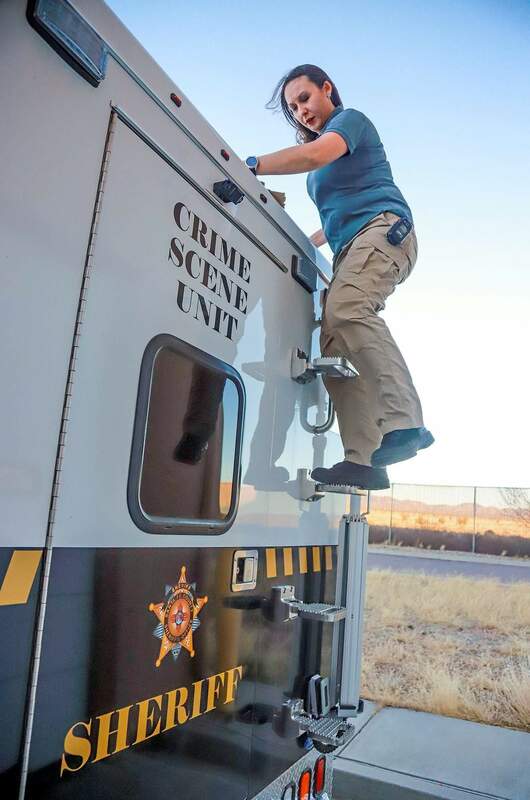 Shari Vialpando, crime scene tech for the Santa Fe County Sheriff’s Office, retrieves supplies from the top of the Mobile Crime Scene Unit that Vialpando uses to process evidence while analyzing crime scenes. Her self-applied Black Widow nickname is apt, she said, because death seems to follow her. Or, more accurately perhaps, she follows death – even when it’s not always readily apparent. In the field, Vialpando said she treats every scene as if it were a homicide. She works through a mental checklist, taking exterior photos of a scene and working her way to photographs of suspects and victims, wounds and evidence. She collects DNA swabs, sprays chemicals that illuminate blood traces and brings evidence back to the Sheriff’s Office to catalog and store, among other things. If she’s not busy on a crime scene, Vialpando also helps transcribe jail phone calls, transport evidence to the state crime lab in Santa Fe and teaches deputies photography skills. Vialpando plans to encourage the Sheriff’s Office to hire more crime scene techs who can help deputies document and process misdemeanor crime scenes. Adan Mendoza, who started as Santa Fe County sheriff on Tuesday, said one of his first tasks is to evaluate the organization to see if he needs to make changes. One of the things he could look at, he said, is at how many crime scenes deputies are processing evidence, and whether he should hire more technicians. While Vialpando is an expert in crime scene processing and an evidence specialist, she’s not done learning. Next to her computer, she keeps a small bobblehead doll of TV character Dexter – a blood-spatter analyst with a dark secret as a serial killer. Vialpando doesn’t have a past like Dexter, but she does have a career goal of becoming a blood-splatter expert. “I think a lot can be told by the bloodshed on the scene,” Vialpando said. Vialpando’s small cubicle is also decorated with certificates and photographs. In some pictures, her three girls beam out at their mom. She also has photos of Jeremiah Valencia. Almost a year after sheriff’s detectives opened the investigation into Jeremiah’s death, the case is winding its way through court. Thomas Ferguson, who was charged with killing the boy, died by suicide in jail. Jeremiah’s mother pleaded guilty to charges of child abuse resulting in Jeremiah’s death and agreed to spend 12 years in prison. Jordan Nuñez, who is accused of dealing the fatal blow that killed Jeremiah, is heading to trial in late 2019 on a dozen felony charges including child abuse resulting in death. In general, Vialpando said court proceedings can either be one of the best – or worst – parts of her job.